Important: you must take the SAT or GRE test by the application deadline. The only upcoming date to take the SAT outside the U.S.A. is 9 March 2019, with registration deadline on 8 February 2019. Remember to send your scores to the University of Bologna selecting the codes 6993 for the SAT test and 7850 for the GRE test. According to the order of the ranking, winners will be assigned Unibo Action 2 study grants until all the grants are used up. Next, winners in the subsequent positions will be assigned Unibo Action 1 tuition fee waivers, until the entire budget is used up. It is not possible to receive both benefits. 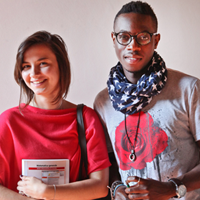 The University of Bologna offers Unibo Action 2 study grants and Unibo Action 1 waivers for A.Y. 2019/20, reserved for students who were awarded the same benefits for A.Y. 2018/19. In order to obtain the renewal you must apply by the deadlines set in the call for applications, be in possession of the requirements set in the call for applications and be placed among the winners in the ranking list. Renewals are not awarded automatically. Sign up to receive email updates about Unibo Action 1 and Unibo Action 2 calls.